It quickly becomes clear that Lasbury really knows his stuff on what happens in different Star Trek episodes and the assorted 'technical manuals' that have sprung up around the series. If anything this aspect is over-done. There doesn't seem too much point labouring over why a technology is explained differently in a later episode than an earlier one - in the end it's because they had different writers and the later one couldn't be bothered to check. There's an element of 'this is fiction, get over it,' about this kind of detail. The level of detail on the real world technologies is impressive - I think this book will strongly appeal to an audience that loves this kind of working through possibilities systematically - for example, looking at all the different ways we can do something roughly similar to phasers. Some parts such as lasers are likely to be familiar, but others, for example the idea of using a laser to ionise a path through air, then sending an electric charge along the path - so-called directed lightning - is fascinating. All too often, though, the result deteriorates into a list approach that makes more for completeness than reading pleasure. 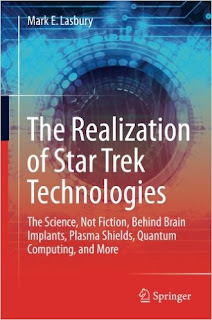 The sections which proved most interesting to me were mostly those where we were closest to the real thing - I found the universal translator section particularly enjoyable - though the tricorder section spent too long on assorted medical add-ons for smartphones. The transporter section (something that was also covered by Krauss) also had plenty of absorbing content, though it's a shame Lasbury doesn't mention the no cloning theorem - or more entertainingly, the objection to the Star Trek transporter raised in that brilliant film Galaxy Quest of why such an incredibly sophisticated piece of technology requires its operator to smoothly push a pair of sliders. Pretty well all popular science books have a few errors or points where a rather odd comment is made, and there were a number here. When talking about cloaking devices, the author says 'interesting, in both [Harry Potter and The Lord of the Rings], the cloaking devices were actually cloaks; I wonder if this is the genesis of the term "cloaking device?"' The only problem is that Star Trek predates Harry Potter, and the main cloaking device in the Lord of the Rings is, erm, a ring. Not all the problems are about cultural context. We're told photon torpedoes involve matter/antimatter annihilation, so no light is involved. Remind me what is produced when, particles and antiparticles annihilate? Oh, yes - photons. Strangest of all is the description of the orbit of comet 2015 TB145; Lasbury tells us its orbit is 'very oblong.' I've seen diagrams of its orbit and - not surprisingly - it isn't at all rectangular. If you really like getting into the detail of this kind of tech, this is going to be an excellent read for you. I can't give it more than three stars for the general reader, because it is too much of a 'listing every possible technology and how it works' book, but there's no doubt there will be an enthusiastic audience for this material.